Plamondon. Orange Line. Opened 1982. On 10 June 1836, Le Canadien published what might be considered the nineteenth-century equivalent of a status update. Of course, his arrival in Montreal needed to be announced, and on this occasion he received what might be called a “like”, this time in Ludger Duvernay’s La Minèrve. After several days in the town, one ‘like’ might be today be disappointing, but times were slower then and this “like” was more in the way of a share with comments from an editorial we and far more than a mere thumbs up. We have gone to see our compatriot, Mr. Plamondon, who is arrived from our capital since three or four days with the view of passing some time at Montreal and exercising his art here. We have always heard talk of Mr. Plamondon as a capable artist. Some connoisseurs who have had occasion to see his canvases have given us the greatest praises. We are now convinced ourselves that there is no exaggeration in those who give them, and we do not hesitate to proclaim Mr. Plamondon the first talent of the country in the matter of painting. We strongly encourage lovers of art and those who wish to study it to profit from this opportunity. This must have been particularly helpful, Plamondon’s own talents notwithstanding, as Durvernay had made it his business to be at the heart of the a rising French-speaking bourgeoisie whose political ambitions were coming into direct conflict with the British establishment. Still, in the course of his stay, Plamondon found clients in Louis-Joseph Papineau, the speaker of the Legislative Assembly and leader of the Parti Patriote, and John Redpath, the Scottish sugar magnate and owner of a substantial estate in what is now downtown Montreal. Such was Plamondon’s success that he left many of Montreal’s elite unsatisfied. Mr. A. Plamondon, artist, presents his sincere thanks to the Ladies and Gentlemen of this town for the liberal encouragement that he has received during his visit here. M. P. returns to Québec where he has been expected already for some time; he very much regrets not having been able to satisfy all the requests. Nevertheless, he consoles himself with the hope of returning to this beautiful city next spring. 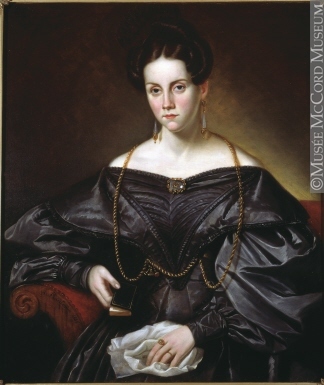 Jane Drummond, 1815-1907, by Antoine Plamondon (1836). McCord Museum, Montreal. That hope was never realized, but as hinted at above, Plamondon’s success concealed divisions that he talents were able to straddle. These would errupt at the following year in the Lower Canada Rebellion, with the freshly painted Papineau at its head. For the moment though, Duvernay gave division a far more congenial, if barely concealed expression, in a celebration of the Canadien nation. By electing Saint John the Baptist as the nation’s patron saint, Duvernay’s report of the dinner to mark the saint’s day on 24 June ran next to his praise of Plamondon. Here we meet the well-known singer-songwriter, George-Etienne Cartier and see as the one time American, T. S. Brown remarks, that the divisions were not a simple matter of language. 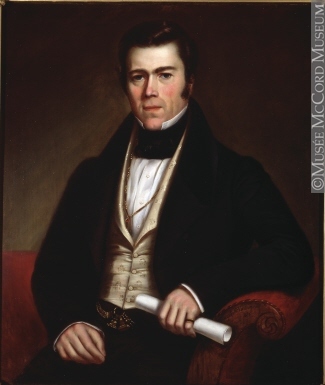 The Canadien patriotes found inspiration in the struggles in Ireland of O’Connell, remembered Daniel Tracey, while the Edmund O’Callaghan, now recovered from cholera, offered support to the reformers of Upper Canada. The anniversary of the Patron Saint of Canada, he who, nineteen centuries ago, came to prepare the world for the way of moral reform, was celebrated in this town last Thursday at the Rasco Hotel by a public dinner, and with all the pomp and solemnity that the occasion seemed to demand. The meeting was large. The joy and most lively satisfaction was apparent on all faces. The room was elegantly decorated with bouquets of flowers and festive leaves wherever one looked. Among these, most remarkable was of maple branches full of leaves, flanked by two tricolours dominated by the British ensign. At the end of the room, placed above the president, there was inaugurated a superb transparency showing Saint John the Baptist on the banks of the Jordan. An immense table, splendidly served, filled with verdure and crystal, wrapped around the length of the room in a horse shoe, and presented the most magnificent sight. Towards seven o’clock the party was asked to take their places at the table, presided by the honourable D. B. Viger. MM. P. Dunn, T.S. Brown, J. D. Bernard and P. Beaubien acted as vice-presidents. When we lifted the tablecloth [I am not sure of my translation of oté la nappe here; was lift the tablecloth a custom? ], M. le Président offered the following toasts, each of them accompanied by observations and which were followed by a salvo of applause. 1. To the feast that we honour and those who celebrate it. Rein n’est si beau que son pays, &c.
M. le Président in the speech that he accompanied this toast, and which we very much regret to be unable to reproduce, said, while speaking of the maple – there was a festoon near him: This tree which crosses our vales, over our hills, at first young and battered by tempests, languishes receiving its sustenance with pains from the soil that produces it, but soon it launches itself, and becomes great and robust, braving the storms and triumphs over the cold north wind which no longer makes it tremble: the maple is the king of our forests, the emblem of the Canadien people. 2. To the people, legitimate source of all political power. M. Duvernay stood and sang the following song, composed for the occasion. Chassin les soucis et l’ennui. Avant de conquérir se tête } biz. En vain l’on veut nos désunir. La force nait de la concorde ! Le fleuve de la liberté. Le monument de nos combats. Et nous saurons vaincre ou mourir. 3. To the king, may he never forget that his throne has liberty for a base. Air: God Save the King. Louis-Joseph Papineau, by Antoine Plamondon (1836). National Gallery of Canada. 4. 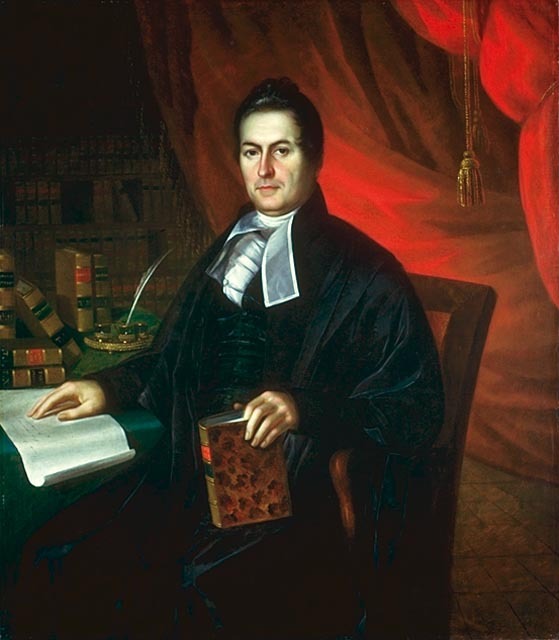 To the Honourable Papineau and the commons of the province, may they always defend our rights and liberties with the same courage as they are shown by the faithful guardians. Sol Canadien, terre chérie etc. 5. To agriculture, industry, and commerce, may they flourish in the shelter of faire: privileges and monopolies make them languish and perish. Riches cités, gardez votre opulence, &c.
M. le Président had difficulty achieving his observations for this toast. Someone announced René Kimber, écr., M.P.P., who took his place to the left of the president and so the health was drunk with lively applause. 7. To trial by jury: one of the two columns on which reposed the whole edifice of our rights. The honourable D. B. Viger gave a discourse which was vigorously applauded. 8. M. Roebuck, O’Connell and Hume, objects of our recognition, may their efforts and those of the reformists of Great Britain and Ireland be crowned with success. 9. To Upper Canada: may its children leave the field conquerors in the fight which they are engaged to obtain responsible government. This toast was not long announced before spontaneously the liveliest applause and noisiest cries came from all parts. It is impossible to describe the enthusiasm with which it was received. Dr O’Callaghan, M.P.P. made a long speech on the state of the province of Upper Canada and was frequently interrupted by long applause. He finished by proposing this toast: may our reformist brothers in Upper Canada succeed. 11. To the United States and elective institutes: may the government of His Majesty realize the declaration made in the Chamber of Commons on 16 May, which has the great end of the giving the colonies a government which leaves them nothing to envy when passing the frontier which separates them from the Union. After which M. le Président made several observations from which we are able to recall only this phrase: Lord Wellington declared several years ago in the House of Lords in England, that we must have nothing to envy the United States for. “I lived for a long time in the United States and I glorified them. When one thinks that they are today with those who were under the dominion of England, has one not the right to be astonished, and can one not congratulate them for the event which places them so high in the level of civilization? Is it not more honourable for England to see them now as they are than as they were colonies? “If I was born English I would say to England you disgrace yourself in following the policy that you hold with regard to the colonies. In effect, what liberty do we enjoy in Canada? In the United States the majority governs. One does all for the happiness of the people. When a law is judged necessary for the advance, no one opposes it there. At the same, one encounters no obstacle when it is necessary to act to revoke or amend an existing law which harms the people. One presses to remedy ills and the abuse is corrected. Commerce, industry, manufacturing, all flourishes there. Here, nothing at all. You buy in England at a high price that which you could buy yourself cheaply here. In place of buying your flags of England, make your own. You have in Canada all that you need for the establishment of factories. The legislature must favour more the poor than the rich. 12. To the memory of Waller, Tracey and Bourdages and all the patriots who have preceded in the cause of reform. 13. To the liberty of the press: just governments have nothing to fear from publicity. Only injustice needs to cover its tracks in a secret veil. Air: A la claire fontaine. 14. To the clergy of Canada, may it continue to give us the example of virtue that it preaches, and work for the advance of education like religion and morality! 15. To Josephte, wife of John the Baptist, friend of her spouse who did nothing without taking his advice, may she save the empire of grace and virtue. M. le Président showed the guests how deep his feelings of gratitude were, and retired. M. Dunn was called to the chair. By M. Neysmith: MM. Chapman and Revans, two defenders of the Canadien people, their name engraved on our memory, may they obtain the dignity commensurate with their virtues and talents. By M. Boulanget: to the Irish, may the memory of their suffering and their ills, put them on guard against oppression and tyranny, and remind them them that our cause is the same. By M. O’Callaghan: to M. Duvernay, the founder of our national day, Saint John the Baptist’s. M. Duvernay offered his thanks and proposed: Our friends in the country who celebrate at this time the Day of Saint John the Baptist? The most perfect union and harmony reigned all the time and in this respect as in so many others assembly was never surpassed. John R. Porter, “PLAMONDON, ANTOINE,” in Dictionary of Canadian Biography, vol. 12, University of Toronto/Université Laval, 2003–, accessed November 14, 2013, http://www.biographi.ca/en/bio/plamondon_antoine_12E.html. John R. Porter, “Plamondon: Over Hill and Vale” in John R. Porter and Mario Béland, Antoine Plamondon, 1804-1895: Milestones of an artistic journey (Québec: Musée national des beaux-arts du Québec, 2006), 13-39. La Minérve (Montreal, 29 September 1836), p. 3. La Minérve (Montreal, 27 June 1836). p. 2. Le Canadien (Quebec, 17 June 1836), p. 3. La Minèrve, 27 June 1836, p. 2. 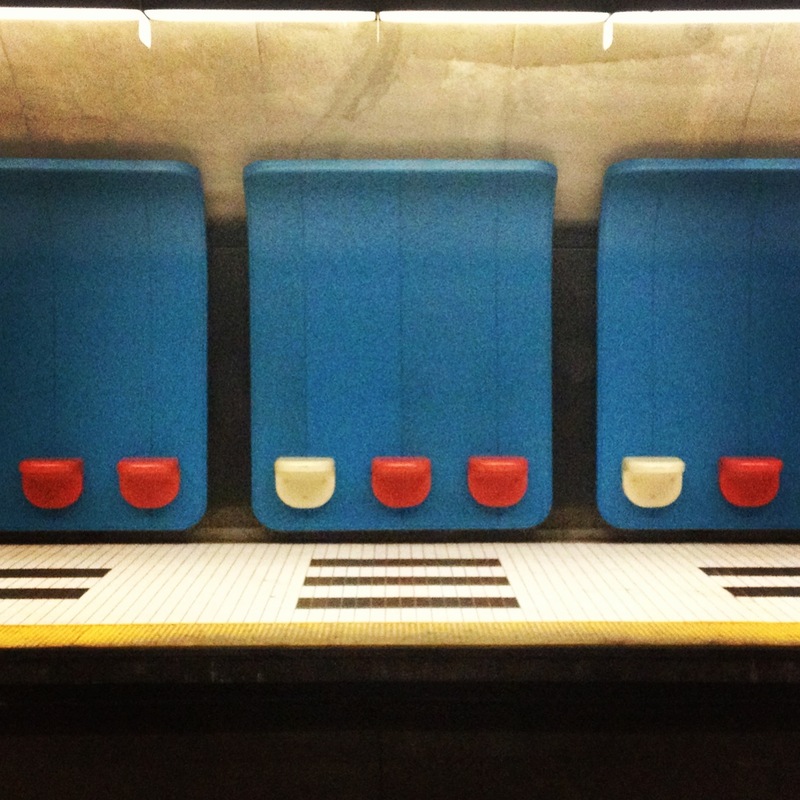 Posted in Montreal Metro, Orange Line. Tagged Edmund O'Callaghan, George-Etienne Cartier, Jane Drummond, John Redpath, Louis-Joseph Papineau, Lower Canada Rebellion, Ludger Duvernay, Plamondon, St Jean-Baptiste, Upper Canada Rebellion.